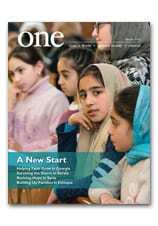 CNEWA’s flagship quarterly magazine, ONE, took top honors, including Magazine of the Year (in the mission magazine category) at the 2017 Catholic Press Association awards last week in Quebec City, Canada. The magazine won a total of 31 awards — the most in its history — in categories that included writing, photography, graphic design and online newsletter. The panel of judges was comprised of journalism professors from Marquette University and Spring Hill College. A Coptic villager in Upper Egypt checks his cell phone while transporting crops across town. This image is part of a photo essay by Msgr. Kozar which was honored last week with a First Place Award from the Catholic Press Association. Visit this link to see more of his prize-winning photos.